This entry in the Wisdom of the East series consists of a translation of the Jodo-Wasan, the Psalms of the Pure Land. This text is by Shinran Shonin, the 10th century Japanese monk who founded Shin Buddhism, a branch of Pure Land Buddhism. This is one of the most popular sects of Buddhism in Japan, centering around devotional practices as the way to enlightenment. It is a singular fact that though many of the earlier Buddhist Scriptures have been translated by competent scholars, comparatively little attention has been paid to later Buddhist devotional writings, and this although the developments of Buddhism in China and Japan give them the deepest interest as reflecting the spiritual mind of those two great countries. They cannot, however, be understood without some knowledge of the faith which passed so entirely into their life that in its growth it lost some of its own infant traits and took on others, rooted, no doubt, in the beginnings in India, but expanded and changed as the features of the child may be forgotten in the face of the man and yet perpetuate the unbroken succession of heredity. It is especially true that Japan cannot be understood without some knowledge of the Buddhism of the Greater Vehicle (as the developed form is called), for it was the influence that moulded her youth as a nation, that shaped her aspirations, and was the inspiration of her art, not only in the written word, but in every art and higher handicraftsman-ship that makes her what she is. Whatever centuries may pass or the future hold in store for her, Japan can never lose the stamp of Buddhism in her outer or her spiritual life. The world knows little as yet of the soul of Mahayana Buddhism, though much of its outer observance, and for this reason a crucial injustice has been done in regarding it merely as a degraded form of the earlier Buddhism—a rank off-shoot of the teachings of the Gautama Buddha, a system of idolatry and priestly power from which the austere purity of the earlier faith has passed away. The truth is that Buddhism, like Christianity, in every country where it has sowed its seed and reaped its harvest, developed along the lines indicated by the mind of that people. The Buddhism of Japan differs from that of Tibet as profoundly as the Christianity of Abyssinia from that of Scotland—yet both have conserved the essential principle. Buddhism was not a dead abstraction, but a living faith, and it therefore grew and changed with the growth of the mind of man, enlarging its perception of truth. As in the other great faiths, the ascent of the Mount of Vision reveals worlds undreamed, and proclaims what may seem to be new truths, but are only new aspects of the Eternal. Japanese Buddhists still base their belief on the utterances of the Buddhas, but they have enlarged their conception of the truths so taught, and they hold that the new flower and fruit spring from the roots that were planted in dim ages before the Gautama Buddha taught in India, and have since rushed hundred-armed to the sun. Such is the religious history of mankind, and Buddhism obeys its sequence. The development of Mahayana Buddhism from the teaching of the Gautama Buddha has been often compared with that of the Christian faith from the Jewish, but it may be better compared with the growth of a sacerdotal system from the simplicities of the Gospel of St. Mark. That the development should have been on the same lines in all essential matters of symbol and (in the most important respects) of doctrine, modified only by Eastern habits of thought and environment, is a miracle of coincidence which cannot be paralleled in the world unless it be granted that Christianity filtering along the great trade routes of an earlier world joined hands with Buddhism in many unsuspected ways and places. Evidence is accumulating that this is so, and in a measure at present almost incredible. And if it be so—if it be true that in spite of racial distinctions, differences of thought and circumstance, the religious thought of East and West has so many and so great meeting-points, the hope of the world in things spiritual may lie in the recognition of that fact and in a future union now shadowed forth only in symbol and in a great hope. 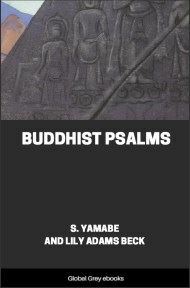 This, however, is no essay on Buddhism, either earlier or later, and what I have said is necessary to the introduction of these Jōdo-Wasan, or Psalms of the Pure Land, which are a part not only of the literature, but also of the daily worship and spiritual life of Japan. Their history may be briefly told. Buddhism passed into Japan from China and Korea about 1,320 years ago, in or about the year A.D. 552. It adapted itself with perfect comprehension to the ideals of the Japanese people, inculcating among them the teachings of morality common to the great faiths with, in addition, the spiritual unction, the passion of love and sympathy, self-devotion, and compassion, in which Buddhism and Christianity are alike pre-eminent. The negative side of Buddhism, with its passionless calm and self-renunciation, is the only one that has been realised in the West, and the teachings of Mahayana which have borne fruit and flower, visible to all the world, of happiness, courtesy, kindliness in the spiritual attitude of a whole people, have never received the honour which was their due. For with the Buddhist faith there came the germ of the belief that the Gautama Buddha in his own grandeur bore witness to One Greater—the Amitabha or Amida Buddha—that One who in boundless Light abideth, life of the Universe, without colour, without form, the Lover of man, his Protector and Refuge. He may, He must be worshipped, for in Him are all the essential attributes of Deity, and He, the Saviour of mankind, has prepared a pure land of peace for his servants, beyond the storms of life and death. This belief eventually crystallised and became a dogma in the faith of the Pure Land, known in Japan as Jōdo Shinshu, a faith held by the majority of the Japanese people. It is a belief which has spread also in Eastern Siberia, many parts of China, Hawaii, and, in fact, where-ever the Japanese race has spread. And the man who stated this belief for all time was Shinran Shōnin, author of the Psalms here presented.